"Relationships are vital to success. Do you express your care and concern for others outwardly?" 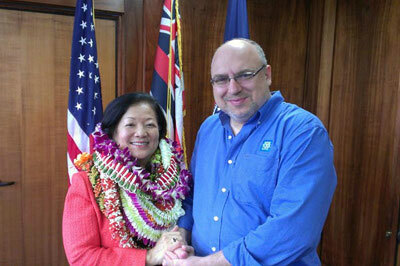 Senator Mazie Hirono with Troy A. Lyndon after her Hawaii swearing-in ceremony. "Troy, thank you so very much for your long hours and selfless efforts on the Amsterdam project. Your vital contribution to the Evangelism Toolbox gave many itinerant evangelists a fresh and dynamic resource to touch countless lives for the kingdom. To God be all praise and glory! I am delighted to serve with you in this momentous time of unparalleled divine opportunity." “Troy has consistently delivered on quality productions. His focus continues to impress me as I have seen him navigate many obstacles towards a goal. Without hesitation, I would recommend him to anyone." "For our first version of iLumina, your work was integral to our ability to complete the project in a timely manner. Our experiences working with you over the course of the past 2 years were quite positive and if opportunity arises in the future, we look forward to working with you again." "Troy Lyndon made our product come to life with his creative forte and valiant work." “Troy is very ambitious. He worked well as one of our Executive Producers. He has a lot of experience and was instrumental in the development of several technology projects in our ministry." "Troy, it is impressive what you have accomplished in such a short time [for New York Life Hawaii]. You are a valuable resource and bring tremendous skills and energy to the table." “Troy is a great man of character and integrity. He executes consistently at a high level and challenges everyone to do the same. He is approachable and professional - and great to work with." "For many years, Troy, I have appreciated that you are a tremendously hard worker, always highly motivated and focused on the needs of your customers. In this world of unreliable and greedy individuals, you are clearly one of the most reliable men I know and have become a dear friend. Your high values and family devotion is also uncommon. I know that anyone who is given the opportunity to know or work with you, will be blessed by your many talents, relationship, and continued encouragement to seek divine providence in everything. May God continue to bless you." “Troy Lyndon is a visionary. His management skills are unmatched. In working with Troy on almost any issue, I've clearly seen why his career has been so amazing." "In the 15 years I’ve known Troy, I have found him to be extraordinarily intelligent and creative. Infrequently do I meet such talent in someone so personable, and I’ve found him to be deeply caring and committed to his family, clients and friends. He has an extraordinary level of perseverance that I feel is responsible for the high level of success that he has thus far achieved. All that know and work with Troy will experience his remarkable nature, giving God glory in everything he accomplishes." "Troy, I have a very high regard for you. I wish you the best of success in your endeavors and am delighted to help you in any way I can." "In teaching the second session, Mr. Lyndon, instructed and directed the students in a team effort to complete an interactive presentation of excellent quality for the local non-profit organization of the Ronald McDonald House...He has always presented himself professionally and does all asked of him." "Thank you Troy so much for creating a great presentation for me to show investors. You are such a blessing!" "Troy's dedication and hard work over the years has given our company a strong web presence and has allowed us to tap into some new markets, via the Internet."